Last Sunday marked the end of the Melbourne Writers Festival for another year. The last few weeks in August are always an excellent time for keen readers and writers in Melbourne (and the world – it’s an international event) – there are all sorts of workshops, exhibitions, author talks and panel discussions. And the best part of it is that students get to be involved. This year, Kew Primary had visits from two authors, Sue deGennaro and Simon Mitchell, as well as a Grade 5 excursion to hear Andy Griffiths and Terry Denton speak. 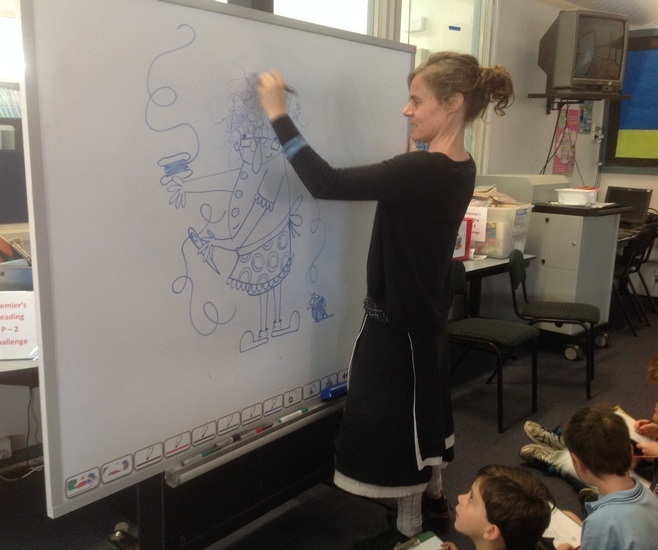 This week author/illustrator Sue deGennaro visited Kew Primary School Library as part of our Book Week celebrations. All students in Prep and Years 1-3 had the opportunity to hear how Sue works and how she creates her fabulous drawings. 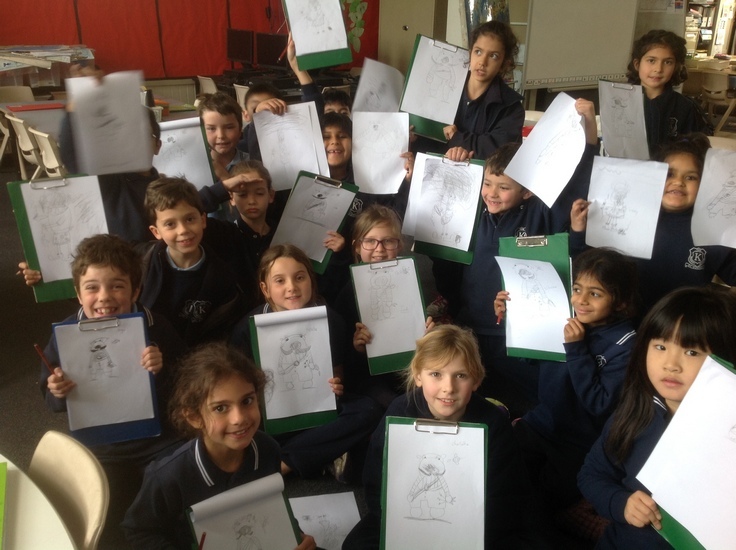 Following Sue’s direction the students were then able to draw some of her characters with amazing results. Sue has been an illustrator for eight years and her favourite book (from her work) is The Pros and Cons of being a Frog which she wrote and illustrated. When asked what other books she liked, she mentioned The Day the Crayons Quit (a KPS favourite). And guess what Sue was before she was an author and illustrator? A trapeze artist! Sue has collaborated with many authors including Jackie French and Tony Wilson. Her titles include The Emperor’s New Clothes Horse, The Hairy-nosed Wombats Find a New Home and Just One More. 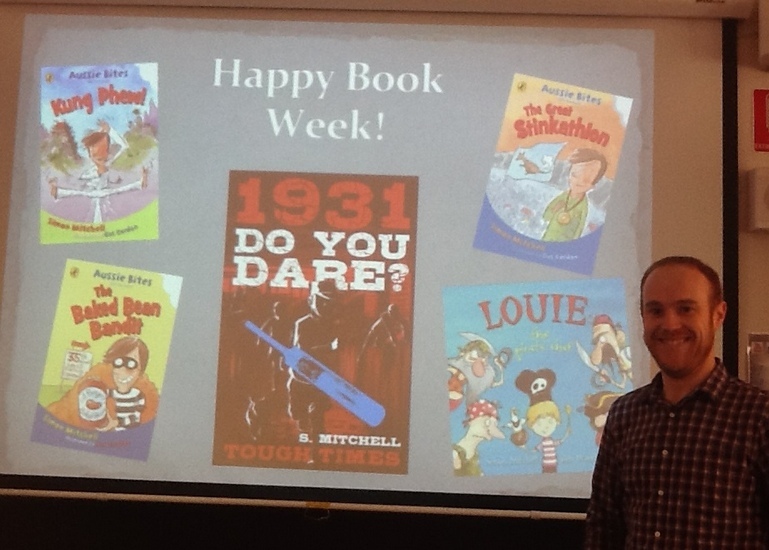 Simon Mitchell spoke to Years 4, 5 and 6. Simon’s latest book is called Tough Times and it is about Melbourne in 1931. 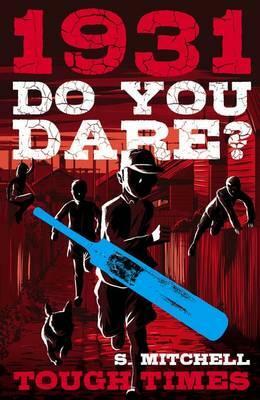 It’s from the Do You Dare series, a collection of Australian historical fictitious stories aimed at boys aged 8 to 12. The stories are fast-paced and adventure-driven, all within an historical context. The Macrobertson Chocolate Factory developed Freddo frogs based on frogs from Merri Creek! Simon discovered that lots of women at that time had their teeth removed when they got married to save their husbands the expense of dental work. It was given as a wedding present! Some of Simon’s other titles include The Baked Bean Bandit, The Great Stinkathon, Kung Phew! and Louie the Pirate Chef. This entry was posted in Learning, Students and tagged Book Week, books, excursion, incursion, reading by Kate W. Bookmark the permalink.